A new day, a new launch and what do we have here? 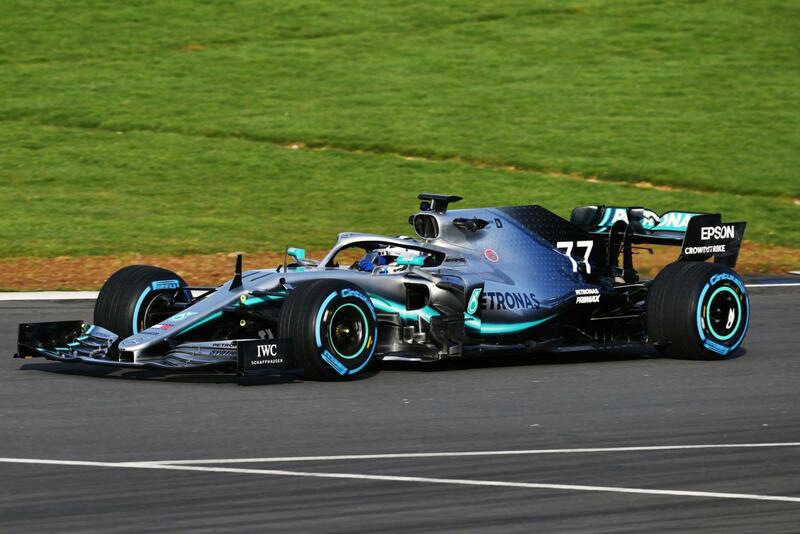 Mercedes’ 2019 Formula 1 car and I have to say, I think this is the best looking car – so far. The Mercedes-AMG Petronas Motorsport w10 EQ Power+ went out on track this morning at Silverstone with Valtteri Bottas behind the wheel as you can see in the pictures further below. This afternoon, his team-mate, Lewis Hamilton will be behind the wheel. There’s around 4 weeks to go until the start of the 2019 Formula 1 season and I think it’s safe to say that fans around the world are eager for the season to start – with many changes from teams and driver shifts, we could see closer battles this year and that’s what we all want. In the meantime – take a look at what Toto Wolff had to say about the car and new regulations. Today – the car will be running an official 100km filming day – the team will then also use a final systems check before the first pre-season testing in Barcelona. There have been substantial changes to the W10 and most of these modifications have been made due to the changes in the Technical Regulations for the 2019 Formula 1 season. While the chassis development was partly driven by regulatory changes, the Power Unit regulations remained largely stable – making the development work more of an evolutionary process in which the team worked hard to achieve two main goals – improving performance and reliability. Mercedes-AMG Petronas started work on the all-new Formula 1 car over 16 months ago – when the team was still fighting for it’s fourth Championship Title. Initially, the development work was taken out by a small group of the teams engineers – working on the general concept of the car. Over the course of the 2018 season, more and more engineers from Brixworth and Brackley started working on the W10. Take a look at more pictures below from the car on-track and the official images released from Mercedes.